Apparently Manti Te’o isn’t the first Samoan guy to get tricked by an imaginary girl. Even before the Internet. This is the first article I’ve read about this story that’s made any sense whatsoever. Go, Blessed Margaret of Castello! Blessed Margaret of Castello is apparently the go-to Blessed for kneecaps. You notice the points that atheists tend to think never happen: it involves both a non-Catholic and totally new body parts. Bl. Margaret was disabled, abandoned as a child by her well-to-do family, and lived a difficult life, working and desperately poor. Yet she grew up not only not bitter, but a provider of alms to others whom she felt were less fortunate than she. She also has a shrine in Columbus at Old St. Patrick’s, behind the Convention Center. The article also tells some interesting stories about stuff that’s happened there. Some people here in Ohio seem to think she’s a go-to blessed for babies and fertility problems also, but this isn’t mentioned in the article. Anyway, the secondary point here is that this is the kind of miracle that might count as a sign in favor of canonization. Which would be a good thing, as she’s a great woman to know. Because if we give up believing in the Trinity, everybody will like us, the Jews will admit that Christianity was right, and there’ll never be any arguments again. Yeah, and that’s why everybody in the world is a Jewish Unitarian Jehovah’s Witness! Because eliminating theology and the Trinity is such a great recruiting tool, and produces instant Judeo-Christian unity! Secondly, it’s fairly obvious that this “artist” wishes desperately to have the chops and courage to create real religious art of Mary, but turns to satire out of fear of putting himself on the line. It’s pretty sad to confess to the world instead that mass-market action figure designers and kitsch artists are braver and better at art than yourself, but I guess anything beats exposing your heart to the world. MLP fandom has its failings (many) but fear of sincerity ain’t one of ’em. However, the really ironic thing is that Mary, being a mother, probably did her bit of dress-up play with her Son and the neighbor kids as an adult, and with her friends as a kid. So dressing her up in Superman robes or a Power Ranger helmet isn’t exactly the way to shock her. So yeah, kinda pointless and fairly safe, on the supernatural level, especially since Mary is notoriously hard to torque off. There’s one fairly nice one (albeit replacing the red hair of the House of David with orange hair is a silly ref) of Our Lady of Fatima in a space helmet, “standing on the Moon” as per the Book of Revelation. Mary merged with some kind of Annie Oakley doll, or a kimono, or some kind of Native American doll? 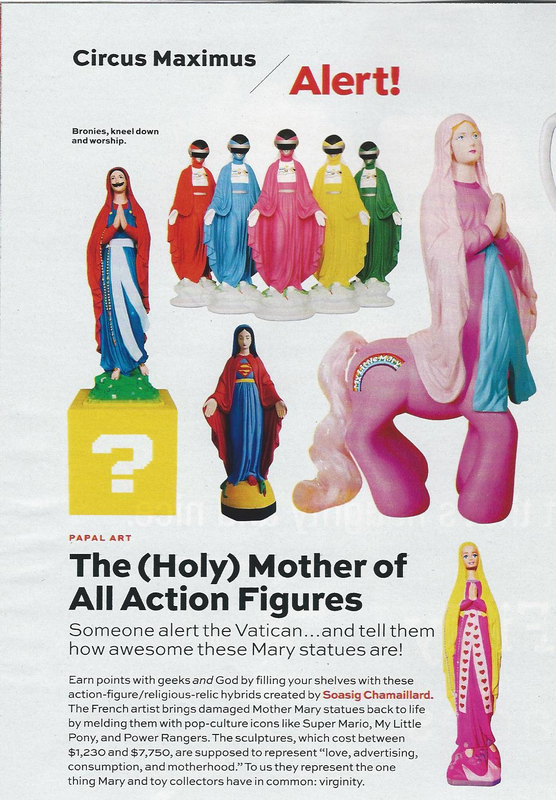 That’s not even pop culture; it’s just normal to depict Mary in the garb of all world cultures. The artist also does one “ouvrante Vierge” with the aid of an inset Polly Pocket playset, but lacks the guts to do it unironically. The artist does not just do Mary, though. 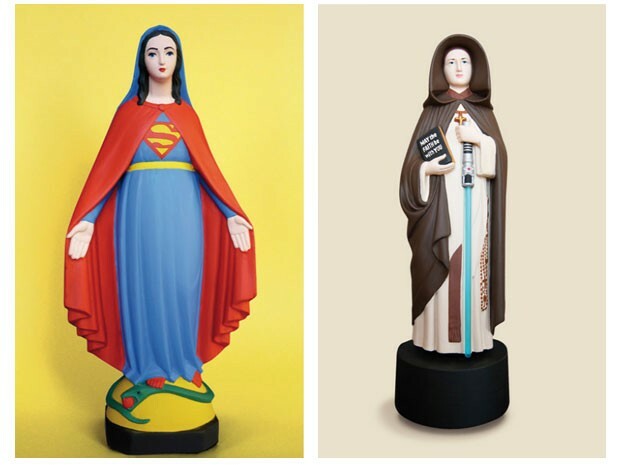 Occasionally the artist also repaints female saint statues into Mary ones (for example, one repainted into Jedi Knight Mary), which is a bit hard on mother foundresses but certainly says something about blasphemy marketability. Since this is all supposed to be a comment on the role of women in the world, you can see that it’s really not the work of someone who likes individual women as people. But this kind of disrespect for others’ individual identity and goals (and heck, for that of the goals of toys and their creators) is always given a pass if you have the correct political view. If you look long enough, the artist does actually manage a few really really offensive pieces. Also, some anti-American pieces and a singularly stupid version of the French Revolution symbol, Marianne. (Stupider because of course the French Revolution was also anti-Catholic, so yeah, it’s taking a Jewish girl and dressing her up as a Hitler Youth, while not realizing that was the offensive part.) So you’ll probably be happier if you don’t rubberneck Google Images. I do it so you don’t have to. Ruadh got into a closed (but not tied shut) bag, pulled out the plastic bag that the paczki were in, pushed her nose into the side of the box until she was inside it, and then inhaled three paczki with lemon filling and a light sugar glaze. She wasn’t hungry for dinner much. Paczki stick to the ribs, I guess because of all the eggs in the dough. I guess Ruadh heard that Lent is coming. Well, This Is a Wee Bit Embarrassing. Either my esteemed relative quoted Archbishop Laud, from the Church of England, and his execution speech, or the pamphleteer decided to add some flourish to his pamphlet. Here’s Archbishop Laud’s execution speech and his prayer. Archbishop Laud was executed in 1645. It’s possible that the printer wanted to put out a pamphlet about Laud and was using O’Brien as a cover, but most of these kinds of blackletter broadsheets and pamphlets included judicious copying/imitation/plagiarism whenever the printer felt like it. Here’s more from the Harleian Miscellany. It just goes to show that sometimes you can’t trust everything that sounds good. Even in 1651. UPDATE: The pamphlet apparently is padded out with some Anglican material from Archbishop Laud’s execution. Oops. And here’s still more from the Harleian Miscellany. Oooooops. It looks like C.P. Meehan’s account is still the better one. Pretty much everything in this pamphlet is just an adaptation from the Anglican Laud pamphlet. Oddly enough, the Harleian Miscellany’s pamphlet talks about Laud’s speech being transcribed by “John Hinde,” and the Collectanea Hibernica pamphlet from the British Museum is titled “The Humble Petition of James Hind.” So maybe this may be blamed on the filing system at the printer’s house? ORIGINAL POST BELOW THIS POINT. Here’s a new-to-me account of Blessed Terence Albert O’Brien’s execution speech, from a pamphlet published on November 21, 1651 in London. O’Brien was martyred on Halloween of that year. It doesn’t mention his prophecy/diagnosis of General Ireton’s death eight days later, but it has a lot of good stuff in it. I’ve modernized the spelling and punctuation a bit. Anyway, onward to the pamphlet’s text! ‘This is a very uncomfortable place for me to deliver myself unto you; but I beseech you pardon my failings, and the rather, by reason of the sad occasion that hath brought me hither. Indeed, I have been long in my race, and how I have looked unto Jesus the Author and finisher of my faith, is best known to Him. I am now come to the end of my race, which I find to be a death of shame, but the shame must be despised, or there is no coming to the right hand of God. Jesus despised the shame for me upon the Cross, and God forbid but I should despise the shame for Him upon the gallows. I am going apace, as you see, toward the Red Sea, and my feet are upon the very brinks of it; an argument. I hope, that God is bringing me to the Land of promise, for that was the way by which of old He led His people. ‘But before they came to the Sea, he instituted a passover for them: a Lamb it was, but it was to be eaten with very sour herbs, as in the 12th chapter of Exodus. I shall obey, and labor to digest the sour herbs as well as the Lamb, and I shall remember that it is the Lord’s Passover. I shall not think of the herbs nor be angry with the hands that gathered them, but look up only to Him who instituted the one and governeth the other. For men can have no more power over me than that which is given them from above, and although I am denied mercy here on earth, yet I doubt not to receive it in Heaven. ‘I am not in love with this passage through the Red Sea, for I have the weakness and infirmity of flesh and blood in me; and I have prayed as my Savior taught me and exampled me: “Ut transiret calix ista,” “That this cup might pass away” from me. But since it is not that my will may, His will be done; and I shall most willingly drink of it as deep as He pleases, and enter into this Sea, I; and I pass through it, in the way that He shall be pleased to lead me. ‘And yet, good people, it would be remembered that when the Servants of God, old Israel, were in this boisterous Sea, and Aaron with them, the Egyptians which persecuted them and did in a manner drive them into that Sea, were drowned in the same waters, while they were in pursuit of them. I know my God whom I serve is as able to deliver me from this Sea of blood as He was to deliver the Three Children from the furnace. [Dan. 3] And I most humbly thank my Savior for it. ‘And I pray God bless all this people, and open their eyes that they may see the right way; for if it fall out that the blind lead the blind, doubtless they will fall both in the ditch. ‘For myself, I am (and I acknowledge it in all humility) a most grievous sinner, and therefore I cannot doubt but that God hath mercy in store for me, a poor penitent, as well as for other sinners. I have upon this sad occasion ransacked every corner of my heart; and yet, I thank God I have not found any of my sins that are there, any sins now deserving death by any known law. And I thank God, though the weight of the sentence lie very hard on me, yet I am as quiet within (I thank Christ for it!) as I ever was in my life. ‘I shall hasten to go out of this miserable life, for I am not willing to be tedious, and I beseech you, as many as are within hearing, observe me. I was born and baptized in the bosom of the Church of Rome, the ancient and true Church; and in that profession I have ever since lived, and in the same I now die. ‘As touching my engagement in arms, I did it in two respects. First, for the preservation of my principles and tenets. And secondly, for the establishing of the King, and the rest of the Royal Issue, in their just rights and privileges. look down upon me in mercy. may pass away and go over me. ‘And my zeal to these (far from arrogancy be it spoken) is all the sin (human frailty excepted, and all incidents thereunto) which is yet known of me in this particular, for which I have come to suffer. I say “in this particular” of treason. ‘But otherwise, my sins are many and great. Lord, pardon them all, and those especially (whatsoever they may be) which have drawn down this present judgment upon me. ‘And when Thou hast given me strength to bear it, then do with me as seems best in Thine own eyes, and carry me through death, that I may look upon it in what visage soever it shall appear to me. ‘O Lord, I beseech Thee, give grace of repentance to all people that have a thirst for blood; but if they will not repent, then scatter their devices so, and such as are, or shall be, contrary to: the glory of Thy great Name, the truth and sincerity of the ancient Catholic religion, the establishing of the Royal Posterity in their just rights and liberties, the preservation of this poor Church in her truth, peace, and patrimony; and the settlement of this distracted and distressed people under their ancient laws and in their native liberties. ‘And when Thou hast done this in mere mercy for them, O Lord, fill their hearts with thankfulness and with religious dutiful obedience to Thee and Thy Commandments, all their days. When he had finished his prayer, he took his leave of some friends there present, saying, “God’s blessing and His mercy be upon you all;” and so went up to the ladder, where he again prayed as followeth. No sooner had he uttered these expressions, but immediately he was turned off the ladder.